It's sad to say, but the City of Anderson, IN has allowed its memorial park, dedicated to one of our nation’s greatest civil rights advocates, to become a dilapidated eyesore. Anderson has resources to properly maintain Martin Luther King, Jr. Park, and not doing so is disrespectful to Dr. King’s legacy, and underscores our city’s lack of commitment to honoring him. Martin Luther King, Jr. Park is one of the smallest parks in Anderson, and it’s only a few blocks away from a Parks & Recreation Department workstation. There’s no excuse for the deplorable condition of this memorial site. Martin Luther King Jr. Blvd. and the surrounding corridor are assets that can contribute to the growth and redevelopment of Anderson’s west side. In response, I started a personal petition to clean up MLK, Jr. Park, and this effort is evolving into an advocacy group - "Friends of MLK, Jr. Park." We've made some progress, but we can never have enough friends. Please contact me at mail@bottletreeproductions.com ​to support this effort. Community Book Center has been an enduring institution in the New Orleans cultural landscape for decades. 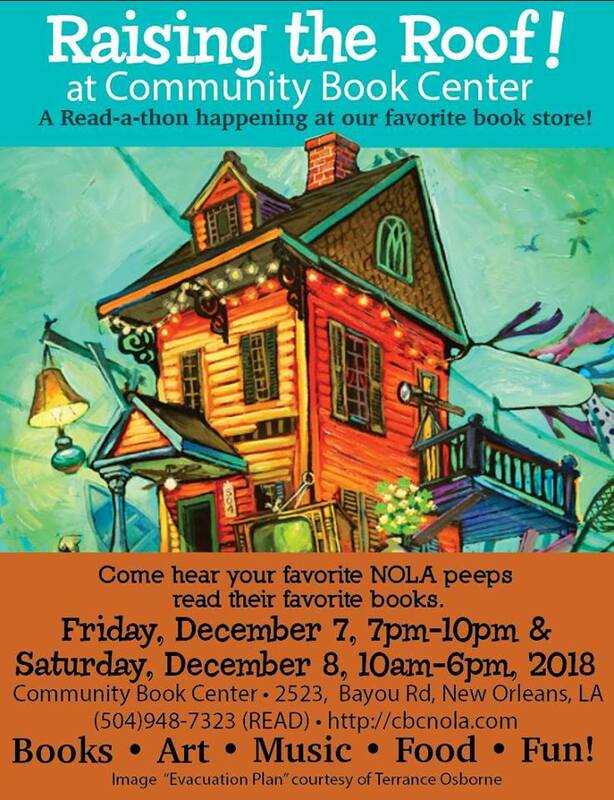 As part of its 35th Anniversary celebration, Community Book Center is collaborating with writers, artists and community groups to produce a Read-a-thon in December. The FREE, two day Read-a-thon will highlight literacy, celebrate readers and writers, and raise funds for Community Book Center's ongoing outreach and education efforts. The event will feature readings by a variety of local authors and poets, food, music and other performances. Community Book Center will have a large selection of books, holiday gifts, clothing and other items for sale. Community organizations and businesses will also staff outreach booths during the event. Would you like to participate in the Read-a-thon? You can APPLY HERE. The deadline for submitting applications is November 20, 2018. Please consider supporting or sponsoring the Read-A-Thon's KICKSTARTER CAMPAIGN. Your contribution, large or small, makes a big difference! For more information visit: https://communitybookcenter.wordpress.com. The New Orleans Loving Festival is seeking participants for a new photography project called "WE ARE FAMILY." 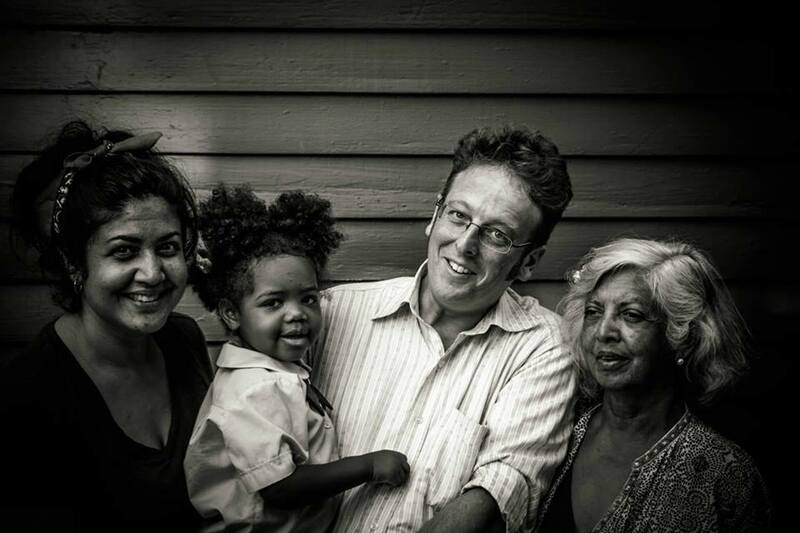 The family photos will be featured on the Loving Festival's website, social media pages, and in a photo exhibition that celebrates the rich diversity of New Orleans families. Participating families will be photographed in their homes or another location to be determined. Families will be asked to provide a short bio to accompany the photo, and will receive a free photograph by New Orleans based photographer, Leona Strassberg Steiner. The "We Are Family" exhibition is tentatively scheduled for June of 2019. ​Interested families should contact Jerald L. White (cfnnola@gmail.com) or Haitham Eid (heid@suno.edu) to participate, recommend a family or get additional information. Click HERE to support this project! I'm really excited about this project! 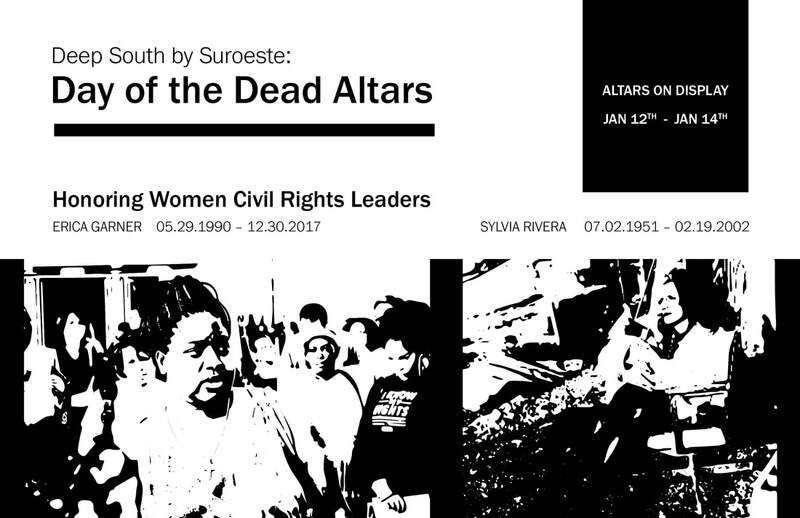 I'll be working with three amazing DSXSO artists (Belinda Flores-Shinshillas, Cynthia Ramirez, and Rolando Palacio) on two Day of the Dead Altars honoring women Civil Rights leaders. 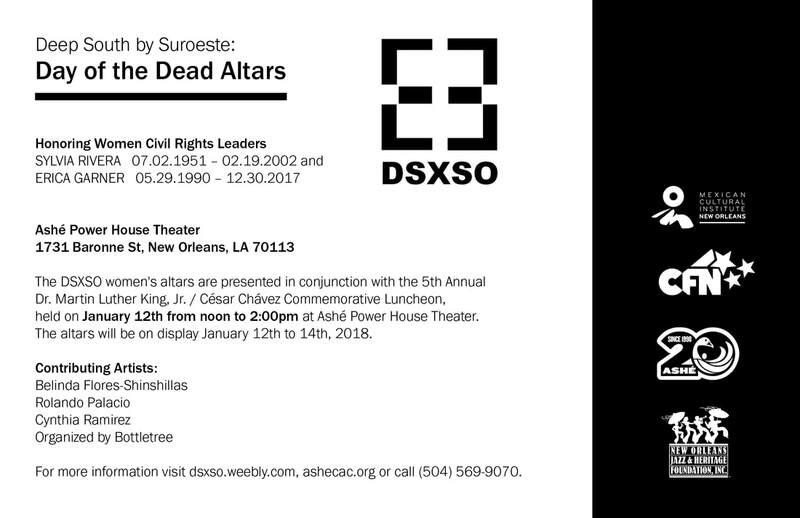 The altars will be presented in conjunction with the 5th Annual Martin Luther King/César Chávez Commemorative Luncheon. In 2015, Angela Fama brought her traveling photo studio to the Loving Festival to question WHAT IS LOVE with attendees. Well she's back with an amazing multimedia exhibition full of answers, and a book featuring New Orleanians and others from across Canada and the United States. This is a must see exhibition. Please spread the word! This project is the official relaunching of Deep South by Suroeste, a creative platform that connects, supports and promotes Black and Latinx artists in New Orleans, LA and beyond. It's been five years since DSXSO hosted a creative collaboration, and it feels good to be back! Win cash prizes and have your writing and artwork published! ELIGIBILITY: The writing contest is open to youth in the Greater New Orleans Area, age 18 and younger. ESSAY TOPICS: Richard and Mildred Loving, Loving v. Virginia, Loving Day, Intersectionality, Colorism, Colorblindness, Racism, and the Multiracial Experience. JUDGING: Essays will be judged by Loving Festival staff and volunteers, based on the following criteria: (1.) Knowledge of essay topic, (2.) Development of the topic and (3.) Clarity of ideas. Posters will be judged on (1.) Appearance, (2.) Presence of a racial justice theme(s), (3.) Creativity and (4.) Neatness. PRIZES: Awarded for 3 essays and 3 posters! First place winners receive $100, second place $75 and third place $50. Winners will be announced in June of 2017. I'm proud to serve on the ﻿​New Orleans Art Institute for Social Innovation's leadership team. The institute is an initiative of the M.A. Museum Studies Program, at Southern University at New Orleans. Supported by a grant from Joan Mitchell Foundation, New Orleans Art Institute for Social Innovation provides professional development and workshop opportunities to artists about the intersection between art and social innovation. The next workshop will be from September 26-29, 2016 at Southern University at New Orleans. The workshop is free. Applications are available online. The deadline for applying is August 15, 2016. #PutYourStampOnLoving is a project to create and publish 50 great stamp designs that commemorate the 50th Anniversary of the Loving v Virginia Supreme Court decision. Selected, stamp designs will be featured in a limited edition Loving Festival Philatelic Collection and online Exhibition. The project will be implemented through the New Orleans Loving Festival. The DEADLINE for receiving submissions is Tuesday, February 14, 2017 at Midnight - Central Standard Time. You will need to create a Submittable User Account to submit your stamp designs. 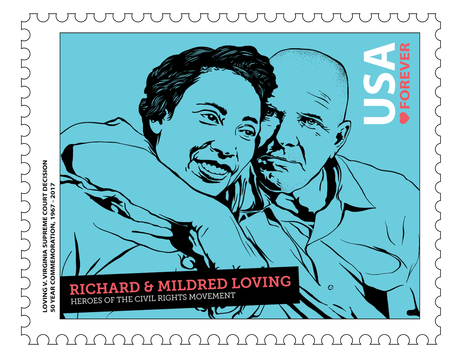 Your stamp design should include text indicating that the stamp commemorates the 50th anniversary of the Loving v Virginia Supreme Court decision, for example: "Loving v Virginia Supreme Court Decision, 50 Year Commemoration 1967 - 2017." Stamp designs submitted after November 1, 2016 must include a $12 submission fee. For submission guidelines visit www.charitablefilmnetwork.submittable.com/submit. NOLF BLENDED BOOKS CLUB is a pilot project that promotes youth literacy and family reading time in the Greater New Orleans Area. Elementary and middle school students, and their families will be invited to monthly book give-a-way events where they can create art, and read books by and about people of color, social justice and the multiracial experience. ​The pilot project will be implemented through the New Orleans Loving Festival. For information about supporting this effort with a donation of new or gently used books, contact mail@bottletreeproductions.com. ​Partners: River Garden Homework Help Program, Transracial Parenting and Community Book Center. Tokens & Souvenirs is an ongoing photography and essay project that documents how Black Americans are depicted in contemporary New Orleans tourism memorabilia. NOLA·RE·SET is a platform for exploring Afrofuturism and cultivating creative projects that further the independence and creativity of youth of color. RESET NOLA will be implemented through the Charitable Film Network. THE NERDY GIRL GANG is a literary blog and craft store rolled into one Sassy·Classy·Smart website. The Nerdy Girl Gang is the brainchild of three nerdy sisters and a cat on a mission to prove that when girls work together the sky's the limit! MY 3DS LIFE is an online art exhibition featuring media created with a Nintendo 3DS Player and other electronics by a very cool kid! The website is an extension of the BLACK BOYSus·pect Photography Project. "Black Boys Suspect / Black Boy Suspect" is a photography project celebrating the diverse identities of African American boys who are embarking on manhood and questioning what it means to become invisible and prejudged as suspect.